The first part of my visit to Mondavi consisted of a vineyard tour led by Senior Wine Educator Inger Shiffler. The winery offers something fairly unique: a small demo vineyard where major grape varietals are planted in clearly-labeled, side-by-side rows. This gives visitors the opportunity during the growing season to see the difference between varietal grapes, and from late summer until harvest they can taste that difference. When you nibble on a merlot grape and then a cabernet grape, believe me: any question you had about how those two varietals differ disappears instantly. A special touch to the demo vineyard, one that I really appreciated, is the two rows of Mission grapes. California's first cultivated grape, it was originally planted in the late 18th century by Franciscan monks at the missions. I'd read about the Mission grape, but never had the opportunity to bite into one. They're not particularly tasty, as I found out (what was the wine like?! ), but I nibbled on quite a few just for the sheer historic pleasure of the experience. Robert Mondavi Winery offers five distinct tours and/or tastings and a few wine education classes, allowing you to enjoy an experience that's perfect for you. Want something simple and inexpensive? Wine Tasting Basics is a real bargain: for $15, you'll get a 45-minute tasting led by a wine educator, covering how to read a wine label, why and how to swirl wine in a glass, and how to smell, taste, and describe wine. Curious about the Reserve wines? The $50 Reserve Tasting, in the company of a wine educator, gives you the chance to taste some of the winery's limited production, reserve, and older vintage wines in a private tasting cellar. You can read about these and other tastings/tours here. We spent about half an hour in the impressive, multi-level, state-of-the-art To Kalon Fermenting Cellar, where Reserve, District, and vineyard-designated red wines are produced and barrel-aged. I found To Kalon fascinating in the way it combines the best of old and new. It's an architectural study in minimalistic modernism and populated with the latest technology. But the grapes were being sorted box by box, by hand---an expensive but quality-producing undertaking that you don't often see. Wine is moved from crush to fermentation to barrel aging by the ancient principle of gravity flow. The Cellar is filled with these wonderful contradictions. Emerging from To Kalon, we were met by VP of Cultural Affairs Margrit Mondavi. 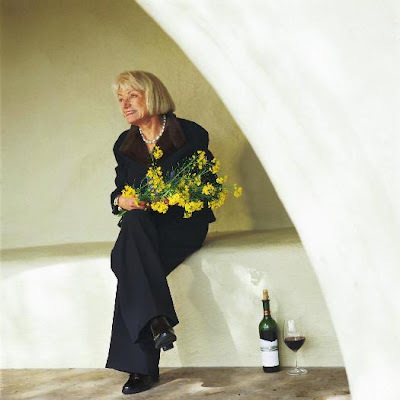 Originally from Switzerland, Margrit joined the Robert Mondavi Winery in 1967, a year after its founding. At that time, wineries did not entertain visitors other than to pour wine; they didn't offer art galleries, bocce ball courts, restaurants, and most didn't even have a gift shop. But, says Margrit, "I had a dream to show wine with art, music and food." Almost immediately she began turning that dream into reality. Supported in her efforts by her her husband, Robert Mondavi, she founded the winery's Summer Music Festival in 1969, which is still going strong (headliners over the years include Ella Fitzgerald, Tony Bennett, and Harry Belefonte). 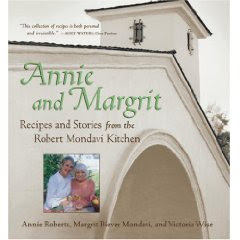 In the 1970s, she introduced cooking classes at the winery designed to pair wine and food (Margrit is co-author with her daughter, a professional chef, of a cookbook, Annie and Margrit: Recipes and Stories from the Robert Mondavi Kitchen ). She has created countless other programs and undertaken projects of all sorts, but that would take a book in itself, so we'll stop right here. On my visit Margrit showed us a portion of the winery's Benjamino Bufano collection. If you live in the Bay Area, you can't help but get to "know" Bufano. Born in 1898 in Italy, he moved to the USA at the age of three. 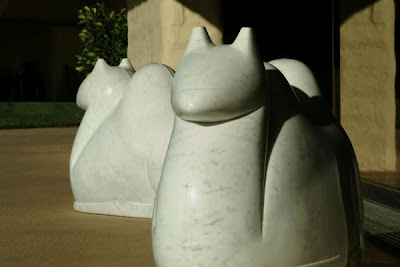 Eventually settling in San Francisco, his streamlined, minimalistic works of people and animals (often in marble) can be found throughout the Bay Area. 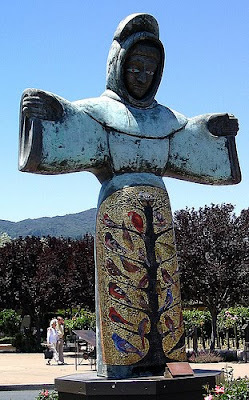 Known particularly for his large sculptures---as, for example, the huge, mosaic/glass/bronze sculpture of Saint Francis that stands at the winery's entrance (shown at the top)---Bufano also produced smaller pieces, such as Dromedary and Camel, shown below, which is owned by Robert Mondavi Winery. I was told that children love to sit atop these camels. Mosher prepared four courses paired exquisitely with Mondavi wines. Throughout the meal I was reminded anew of how incredibly drinkable Mondavi's upper-end wines are. Excellent on their own, but when paired with the right food they are unbeatable (I particularly liked the Ribeye/Cabernet pairing). You, too, can enjoy such a meal at Mondavi. Three days a week the "Harvest of Joy" program includes a winery tour followed by a three-course lunch paired with signature wines in the Vineyard Room. Other food and wine programs available include the ultimate "Four Decades" Tasting and Dinner---you'll taste wine from the 70s on up to today and enjoy an all-out dining experience. So...I ended my first post by wondering how the legacy of Robert Mondavi has held up in the 1.5 years since his death. I'm not wondering any more: this winery continues its adherence to excellence with wines, the arts, and the visitor experience. What more can you want on a trip to Napa? From Publisher's Weekly: In 1965, Mondavi and his brother were doing well running the Charles Krug Winery, which his family had bought some 20 years before. He was 52, hardly the age to start grand schemes such as an entirely new winery; and by his own admission, he's something of a monomaniac, which obviously helped him to establish Robert Mondavi Vineyards, a powerful and revolutionary force in the American wine industry. This book is a fascinating blend of autobiography and the story of how a nascent winery became a formidable challenger to the greatest names in wine making the world over. It assuredly has a place in the Mondavi marketing strategy of educating potential customers about wine. Mondavi also fashions himself a homespun Peter Drucker, dispensing advice on achieving excellence and management success. Despite occasional efforts to acknowledge his overpowering ego, Mondavi is portrayed as a thoroughly driven, egocentric individual who has destroyed much on his road to success. Yet the descriptions of his parents and their immigrant life, the transformation of Napa Valley from sleepy backwater to tourist and boutique winery haven, his relations with many celebrated names in wine and the insider track on 50 years of the American wine business are well worth reading. From the Publisher: The wines of the Robert Mondavi Winery are acclaimed the world over. Less well known is the fact that the winery features a private dining room to rival the best restaurants in the Napa Valley. Here in the Vineyard Room, innovative chef Annie Roberts brings a refined sense of taste and balance to her creations, always designed with the perfect wine in mind. The winery is also home to elegant music and art events, all planned to perfection by Annie’s mother, Margrit. And so a mother and daughter come together to deliver a wine country experience like no other. In Annie and Margrit, renowned cookbook author Victoria Wise shares behind-the-scenes stories of Annie and Margrit’s collaboration over time, along with Annie’s fabulous recipes, reflecting treasures and traditions from her mother’s cooking and influences from life in the Napa Valley. From the start, Margrit and Annie cooked with one another, Annie learning at Margrit’s stove. Years later, Annie became the first executive chef of a winery in the Napa Valley, and developed a repertoire including Squab with Cabernet Sauvignon–Onion Marmalade and Spatzli; Salmon Fillets with Whole Grain Mustard Beurre Blanc; Poussins with Swiss Chard Gratin; and Fresh Plum Galette. Annie and Margrit takes you inside the Mondavi experience, evoking the tastes, sights, and sounds of a day’s visit to the winery.